I've got to be honest here. I've never paid a whole hell of a lot of attention to FOZZY, including the outrageous (though quite comical) stolen-tune spoof, the cover songs, and the whole wrestling connection with Chris Jericho. Although I slowly started to pay more attention when word got out that "All that Remains" is a decent album with no cover songs, I still wasn't expecting much. Well, surprise, surprise, "All that Remains" is a solid hard rock album with lots of pop-inflected hooks and a heavy, riff-driven sound. Save for a few mediocre tracks, I can honestly say that the disc contains no bad songs. The thick, crunchy sound mix immediately got my attention as "Nameless Faceless" kicks off the album. The tune features a rumbling riff that in some ways reminds me of LYNYRD SKYNYRD's delivery on "Saturday Night Special", not to mention a guitar tone and general vibe that feels a bit like BLACK LABEL SOCIETY (just not quite as nasty). "Enemy" sucked me right in with a slick, infectious melody that stuck in my head for hours. It's a song that has "guilty pleasure" written all over it. Going from doomy ALICE IN CHAINS riffing to a slight BLS groove (of course, Zakk Wylde is a guest player on the track), the Ozzy-esque melody and vocals make the song yet another catchy affair, surpassed only by the addictive quality of the title track. I was fine with the rappy vocals on "The Test", thanks to that rumbling chug. Bonecrusher's aggressive barking on "It's a Lie" (also featuring the soaring female vocals of young Allison Irby) surprisingly didn't turn me off; in fact super songwriter Rich Ward does a fine job with the arrangement. "Daze of the Weak", "The Way I Am" (featuring a solo by ALTER BRIDGE's Mark Tremonti) and "Lazarus" are decent tunes, but don't offer much staying power. As an album closer, "Born of Anger" works fairly well, a manic hard rockin' fight tune that moves in and out of a quasi-industrial groove (with effective keyboard splashes). 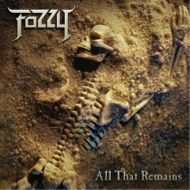 A pleasant surprise to say the least, "All that Remains" is an album that most fans of hooky hard rock will want to check out.